As the holiday season comes into full force, many families are taking advantage of the weather and making the pilgrimage to the slopes. Fun fact: China Peak is less than 65 miles from our office! Taking the time off to spend time with Mother Nature is definitely enjoyable, but there is a hidden risk that sneaks up on many victims every year. Snow blindness, medically referred to as photokeratitis, is a common side effect of receiving too much UV exposure in the eyes. Once this corneal sunburn occurs, a loss of vision can occur. If the exposure is severe enough, medical assistance may be necessary. Seeking the assistance of a quality eye doctor such as Signature Optometry may be necessary. We’re proud to be your go-to team of optometrists in Fresno, delivering a wide range of optical services to our patients Since 1960, our practice has worked hard to serve the community we live in! One problem we consistently hear about and see in our optical office is the negative effects of snow blindness. Today, we’ll highlight what this terrifying ailment is and the best ways to protect your eyes from future damages. If you’re in need of an emergency optometrist or an optical boutique stocked with stylish frames and contact optens, be sure to contact us today! Simply put, snow blindness is a type of sunburn that occurs in your cornea. Excess amounts of UV rays can hurt the eye, causing the cornea to become inflamed. Unfortunately, this phenomenon closely resembles the effects of burnt skin, such as the late symptoms. By the time you become aware of your impaired vision, it’s already too late! 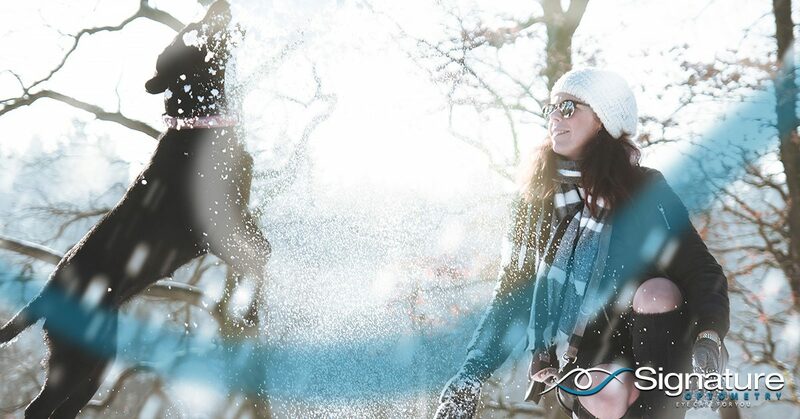 While the name implies that snow is a key ingredient in photokeratitis, the truth is that sunshine and a lot of exposure to it are the only things necessary to cause corneal damage. Snow is very reflective, though, making it a damaging factor that can reflect upwards of 80 percent of the UV rays from the sun back up into your eyes. Snow blindness is also common on the lake and on the beach, as water and sand are also very reflective. Manmade light can also burn your corneas as well! Places such as welding shops, tanning salons, construction sites, and laboratories can produce enough UV radiation to cause photokeratitis. While the reactions from these human-caused damages aren’t technically snow blindness, the symptoms are essentially the same. Like being sunburnt, being sunblind typically worsens after you are removed from the sunlight, typically as the sun sets. These symptoms can be very alarming, especially when the vision loss sets in. Patients with these issues experience serious problems with moving around and performing daily tasks. Some people may be able to see objects clearly enough, yet the colors in their vision may appear warped or strange. The most fortunate part of photokeratitis is the fact that it is usually temporary. Sufferers of snow blindness typically see improvements within the first 24 hours, with symptoms clearing out the day after. The healing process can improve the speed of your recovery, which revolves around resting and avoiding further damages. Be sure to avoid irritating your eyes, especially if you wear contacts. Be mindful of UV rays, utilizing sunglasses at all times when outside. Staying indoors is the best practice when possible. If the symptoms are too uncomfortable, anti-inflammatory pain meds can help when absolutely needed to reduce the problems until everything is back to normal. Rewetting drops are easy enough to find, and can make a major difference in your comfort levels while snowblind. Keeping your eyes moist during this process will also help to promote faster healing. If your symptoms become worse or do not improve after the first day or two, be sure to contact our emergency optometrists for assistance! Snow blindness can be very debilitating for many people, causing strong inconveniences now while creating long-term concerns for future ocular health. Next time, we’ll look at a few smart moves that can be used to minimize your corneas’ exposure to harmful amounts of sunshine. Avoidance, as always, is the best tactic for keeping your eyes healthy through the ski season. Signature Optometry is proud to be your source for quality eye therapy services in California. For decades, our optometrists in Fresno have worked hard to deliver the best care possible to keep our patients happy and healthy for years to come. If you’re in need of an eye exam, be sure to schedule an appointment with our optometrists today!